Why Tom Terrific might not be so terrific for stocks. The Super Bowl indicator suggests that stocks rise for the full year when the Super Bowl winner comes from the original National Football League (now the NFC), but when an original American Football League (now the AFC) team wins, stocks fall. We would be the first to admit that this indicator has no connection to the stock market, but the data don't lie-the S&P 500 Index has performed better, and posted positive gains with greater frequency, over the past 52 Super Bowl games when NFC teams have won. Of course, it's worth noting that this didn't work last year when the Eagles won the Super Bowl, and the S&P 500 lost 6.2% in 2018. A simpler way to look at the Super Bowl indicator is to look at the average gain for the S&P 500 when the NFC has won versus the AFC-and ignore the history of the franchises. This similar set of criteria has produced an average price return of 10.2% when an NFC team has won, compared with a return of 5.8% with an AFC winner. An NFC winner has produced a positive year 79% of the time, while the S&P 500 has been up only 63% of the time when the winner came from the AFC. Would you believe the numbers actually get worse when the Patriots are involved? That's right-the S&P 500 has gained only 2.2% on average in years when the Patriots play in the big game. 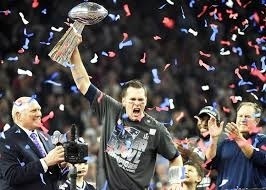 What about since Tom Brady has been the quarterback? The S&P 500 is down 3.0% on average! 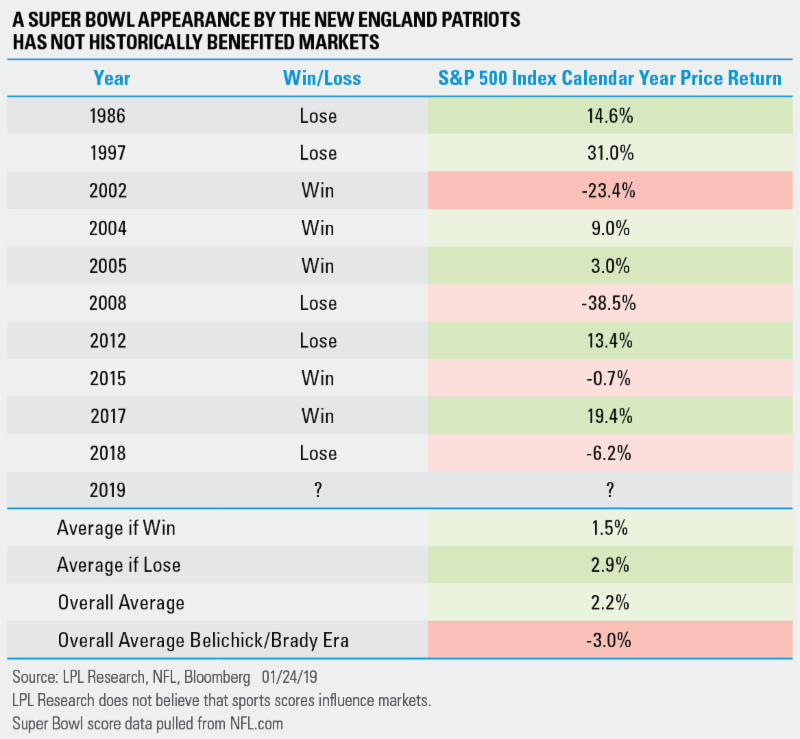 "Pats fans might be ecstatic that Tom Brady is starting in a record-breaking ninth Super Bowl, but market bulls don't want to see the Pats win, as stocks are up only 1.5% for the year on average after a victory versus up 2.9% if they lose," saidLPL Senior Market Strategist Ryan Detrick. "Tom might be terrific, but maybe not in all markets." We would like to reiterate that we realize these calculations are in no way relevant to investors-but it sure is more fun to talk about the Super Bowl and stock market returns ahead of the biggest NFL game of the year than snowfalls and freezing temperatures. We hope everyone has a great Super Bowl Sunday and we wish both the Rams and Pats luck!